A 53-year-old woman with two cats contacted her veterinarian with a concern about a zoonotic parasite. She was bitten by a flea when her home was infested last year and recently noticed a small raised area where she believes the flea bit her. Fearing that there were encysted parasites that needed removal, she was examined by a dermatologist who did not feel the lesion was of concern and recommended watchful waiting. Still alarmed, upon returning home, the woman incised the area, recovered the structure shown, and presented it to her veterinarian for review. This is an example of delusional parasitosis. 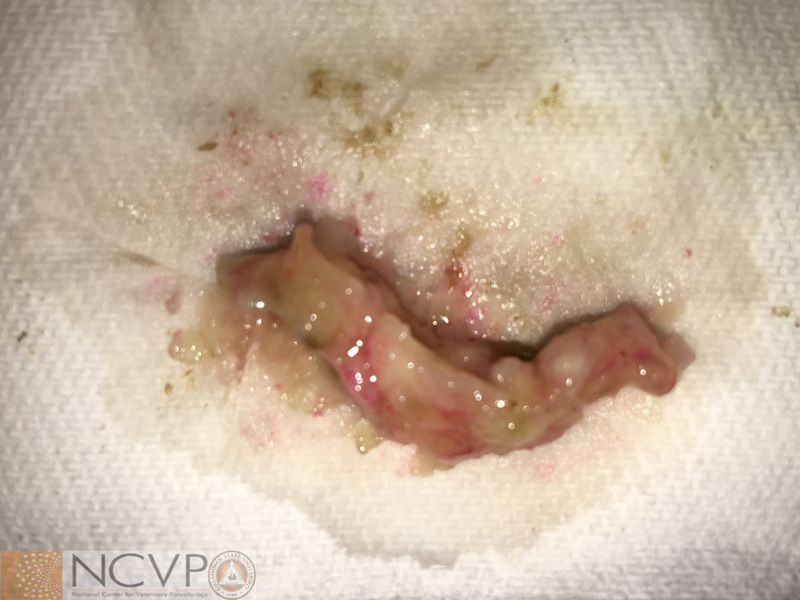 The material removed from the lesion is most likely normal or inflamed tissue but is not a parasite. Delusional parasitosis occurs when individuals incorrectly believe that they are infected or infested with parasites, often even after medical consultations with physicians advising otherwise. Careful consideration of other potential conditions that induce formication (the sensation of small insects crawling on or under the skin) and other paresthesias is usually warranted.